(S0505) Earlier this season, Walt and his children watched Scarface, which felt a bit too much on the nose for my taste. In this week's "Dead Freight," Hank mentions renting the movie Heat, and this time the connection was a little less direct. Heat is in part about a heist, and this episode is very heist-centric. Like pretty much every one of Michael Mann's films, Heat is as much about professionalism -- and in particular professionalism amongst criminals -- as anything else. (It is also about Al Pacino yelling, but that's a given.) Breaking Bad doesn't hit that theme as hard, but its main characters are professional criminals, and they take their job seriously. Walt brings strict scientific principles to the game; he is very serious about the chemistry. Mike is certainly all business, while Jesse is getting more business-like. And let's not forget Gus. 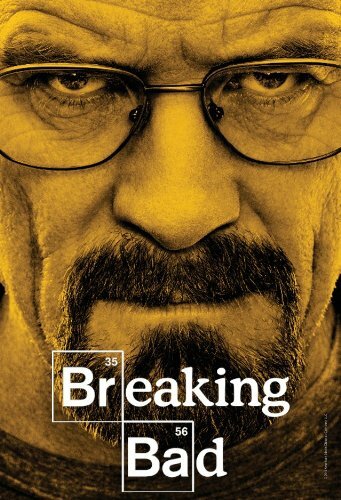 Did anybody treat the meth trade more like just another line of white collar work than him? Early in Heat, Robert De Niro's crew rob an armored car. They are a tight crew of professionals, except for one guy. That guy shoots one of the armored truck crew unnecessarily, and it really screws things up for everybody else. With "Dead Freight," we certainly see a clear parallel. But first, Mike, Walt, and Jesse need to deal with Lydia. It seemed like if somebody was going to bring them down, it'd be her, what with her high strung nature and what have you. Last week, Lydia found a tracker on the bottom of a barrel of methlyamine, and Mike assumed it was a plant from Lydia. So they do the reasonable thing, and kidnap Lydia and handcuff her to a metal grate until things are figured out. Also, previously Walt had planted a bug in Hank's office, after a teary emotional performance that served to get Hank to leave the room. Walt has certainly gotten better at acting. It initially seemed Lydia had indeed planted the tracker, but, and just in time to save her life, the bug lets them know the Houston DEA had in fact put a tracker on every barrel. This was a nice twist. It justifies keeping Lydia around, and it paints the character in a slightly different light. Of course, the issue now is that their methlyamine supply is gone. However, Lydia has a plan, if her life is spared. The new plan involves robbing a train in the middle of the New Mexico desert. If they do this, they will get a ton of the stuff. However, there are many questions to be answered. Some of them are addressed, but there is the issue of the train crew. Mike insists they will need to be killed. Obviously, Jesse is against that. This stops the plan, until Jesse comes up with an idea to get the methlyamine without the train even knowing they've been robbed. I do have a minor issue with Jesse coming up with the last two major plans in this trio. Walt and Mike are geniuses in their own respective ways. Jesse, meanwhile, isn't quite at that level. I realize part of the arc of the show has been Jesse showing that he isn't the goofy doofus he appeared to be early on, but a criminal mastermind? It's a stretch. The plan involves stopping the train, using Kuby (Bill Burr) and a "stalled" truck on the tracks, then running a hose from the methlyamine tanker down to a tank underground, and then running water from the ground into the tanker. Walt has figured the math out, and they've enlisted Todd (Jesse Plemons a.k.a Landry of Friday Night Lights fame) from the exterminator company to help them. The heist scene was shot expertly and was intense throughout, even if it seemed clear it would work. It goes well at first, but then a guy in a pickup drives by and offers to push the truck off the tracks. This shortens their timeframe, but Walt won't have it, and almost costs them. In the end, they finish just as the train starts back up, so Jesse has to lay on the track and Todd has to jump from a moving train. Jesse lying on the train track was quite a nice touch I felt. It seems everything has gone off without a hitch, and that Walt and Jesse will have enough methlyamine to last them ages. They can cook like crazy! Then, the trio turn and see a kid on a motorbike. We saw him in the cold open, and it was the oddest cold open of the season, because it was just some random kid putting a tarantula in a glass jar. Obviously, by the end it made sense. The kid waves. Todd waves. And then Todd shoots the kid. Well, that certainly changes things. This was a really good episode for me until that ending. I thought the heist was top notch from the beginning until the end. I like what this episode did with Lydia. However, I was definitely a bit bummed by the ending. Don't get me wrong. I don't think it was poorly executed or anything like that. I just don't like it when innocent people end up suffering in entertainment. They didn't do anything wrong in the show. In fact, it is quite an interesting plot point that really shakes things up. I just personally didn't like it. Walt killed Gus, and he wanted to be king. Now, he's got a huge mess on his hands. His home life is a mess. He's butting heads with Mike. He's got to deal with a headcase like lydia. Now, most serious of all, Todd has just killed a civilian, and a child to boot. Jesse is going to be devastated, I assume. Plus, a kid isn't just going to disappear without the police getting involved. What is Walt going to do about Todd? Where do things go from here? This episode definitely raised the stakes and, even with my qualms with the ending, I am quite excited for next week's episode. "I just don't like it when innocent people end up suffering in entertainment" They are characters and they don't exist. If people innocent or not don't get hurt then it becomes a very boring show. I think you're a very sheltered individual if think that way about a show. What are you like in real life when the innocent get hurt? You break down? Well Krok, most people in "real life" are acutally averse to the innocent being hurt, especially if it happens in front of them - in fact, there's this concept called "empathy" you might want to look up. It's one of those prerequisites for not being a sociopath. Being able to connect to fictional characters admits a degree of empathy (or at least sympathy) that's kind of the foundation to proper storytelling. If you can't connect to a character, the show becomes way more boring than it would if there weren't people dying. In fact, there are some very successful dramas where people don't die.